If you were asked to learn how to code without any prior knowledge of the concepts, how panicked would you be? Now imagine how terrifying learning to code would be for a kid. The world is run on electronics that they seem to think is powered by magic. They only know how to navigate apps, but don’t know anything about how to create something new. Providing kids with fun options to learn complex principles is the best way to help them understand, and that is the very aim of Cubetto. This is a game for kids 3 and up which teaches the basics of coding and engineering without a computer in sight. 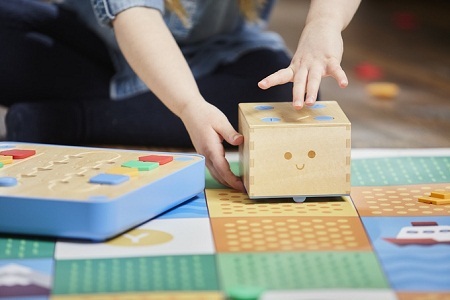 It consists of three parts, which is comprised of the Cubetto robot, the board (a physical programming console), and color-coded blocks which will act as the programming language. The object of the game is to get Cubetto from point A to B on the included map. The color-coded pieces provide Cubetto with functions of forward, right, left, and function. Kids will be playing with algorithms, functions, and loops through physical pieces they can hold. On the board you’ll have the main sequence, a subroutine, and a Go button which sends the data of the combination of pieces to Cubetto. There are multiple maps and story books to guide Cubetto through, and every adventure is going to be completely unique since there’s no wrong way to play. This child-centered play-learning method will cost you $195 for the full set, and you’ll need 6 AA batteries for 4-6 hours of play time.